Customizable document types and metadata sets are new features in Liferay 6.1. 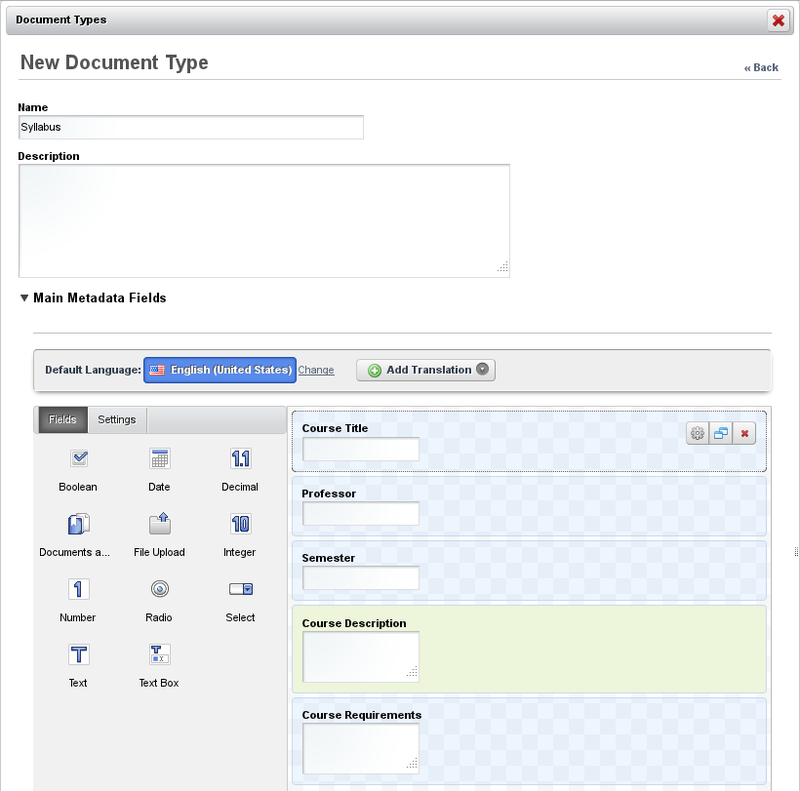 When a user assigns a document type to a document, the user is required to fill out the fields defined by the metadata set of the document type. This encourages users not to forget to enter important information about their documents. For example, you could create a “copyrighted” document type and require users to enter a license for all “copyrighted” documents. More importantly, document types and metadata sets can improve document searchability. The values that users enter into the fields determined by their document type’s metadata set become searchable entities within the portal. You can use Liferay’s search portlet to search for these terms. Document types and metadata sets are accessible from the Manage Button at the top of the Documents and Media portlet window. You can add a new document type using the Add button at the top of the dialog box. To do so, you need to define one or more metadata sets to associate with your document type. When creating a new document type, you can define “Main Metadata Fields” or select “Additional Metadata Fields”. Main metadata fields are directly tied to their document type and cannot be made available to other document types. Additional metadata fields, by contrast, can be defined independently and can be used in many different document types. You can differentiate the document types that implement the same additional metadata set by defining different main metadata fields for them. However, Additional metadata fields need to be defined and saved before creating a document type that will implement them. As an example, we could create a document type called “Syllabus” and define a metadata set. What metadata should we associate with syllabi? Let’s choose for our syllabi to have course title, professor, semester, course description and course requirements fields. All syllabi in our portal should maintain entries for these fields. 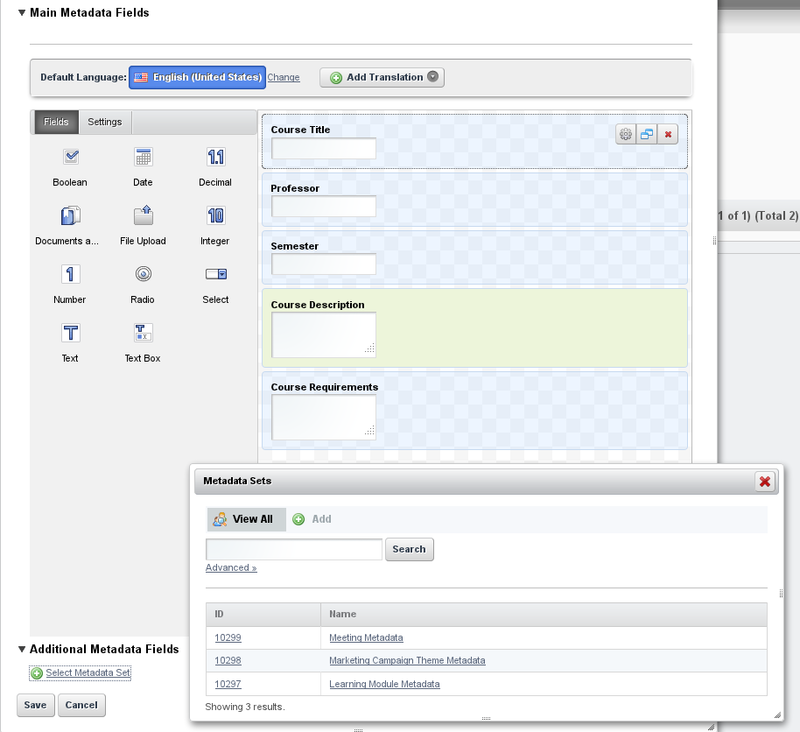 This ensures that a syllabus will show up in a portal search if its course title, professor or semester is searched for. Since we don’t want to use our metadata set for any document type other than “Syllabus,” let’s create our metadata set under the Main Metadata Fields area. Alternatively, we could create our metadata set independently using Manage → Metadata Sets → Add and then select it as an Additional Metadata Field. You can view, edit or add metadata sets from the Manage → Metadata window. 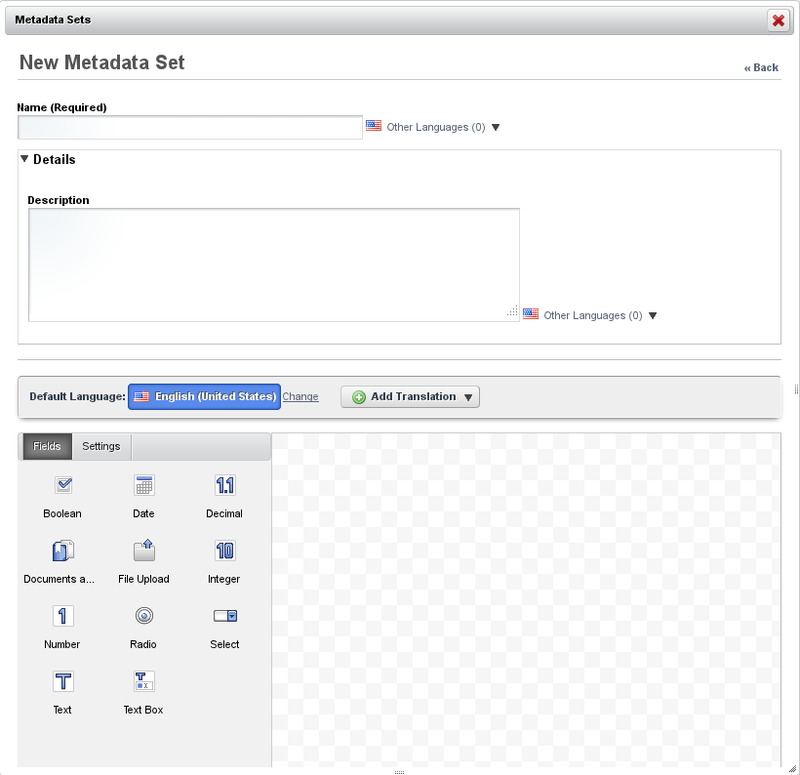 A metadata set consists of a group of fields. If you click the Add button, you can use same UI for defining a metadata set that you used in the Add Document Type window. Date: lets you enter a date. A valid date format is required for the date field, but you don’t have to enter a date manually. When you select the date field a mini-calendar pops up which you can use to select a date. Decimal: lets you enter a decimal number. The value will be persisted as a double. Documents and Media: lets you select a file from one of the portal’s Documents and Media libraries. File Upload: lets you select file to upload from your local system. Integer: lets you enter an integer. The value will be persisted as an int. Number: lets you enter a decimal number or an integer. The value will be persisted either as a double or an int, depending on the type of input. Radio: displays several clickable options. The default number is three but this is customizable. Only one option can be selected at a time. Select: is just like the radio field except that the options are hidden and have to be accessed from a drop-down menu. Text: lets you enter a single line of text. Text Box: is just like the text field except you can enter multiple lines of text or separate paragraphs. Remember that metadata sets created independently are reusable. Once they have been created they can be included in any number of document types as additional metadata sets. Next, let’s take a look at tags. Tags can be attached to most forms of web content that can be created in Liferay, including documents.